The specific motion pattern in overhead and throwing sports results in high stress to the athlete’s shoulder and therefore shows a higher incidence of long-term overload damage. In combination with a repetitive distention of the anterior capsule, the shortening of the dorsal capsular structures leads to a decentralization and posterosuperior translation of the humeral head. Due to the contact of the articular-sided insertion of supraspinatus and infraspinatus tendon and the posterosuperior glenoid rim, a PSI develops. Finally, rotator cuff tears as well as lesions of the biceps anchor complex and pulley system occur. 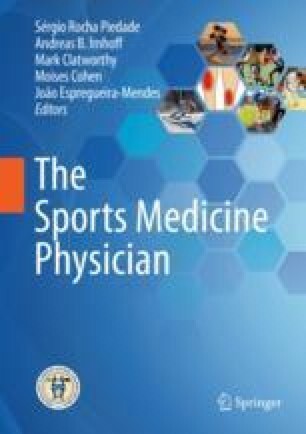 Based on clinical examination and imaging, the five-point check for the athlete’s shoulder was developed, including joint capsule, scapula, joint stability, rotator cuff and biceps tendon complex. Conservative therapy is based on a graded rehabilitation programme including training of the complete kinetic chain, joint mobility, strength, endurance and neuromuscular control. A GIRD should be addressed by stretching, whereas a scapula dyskinesia requires intensive strengthening of the periscapular muscles. Surgical treatment includes SLAP repair, subpectoral biceps tenodesis or refixation of rotator cuff tears to the original footprint.